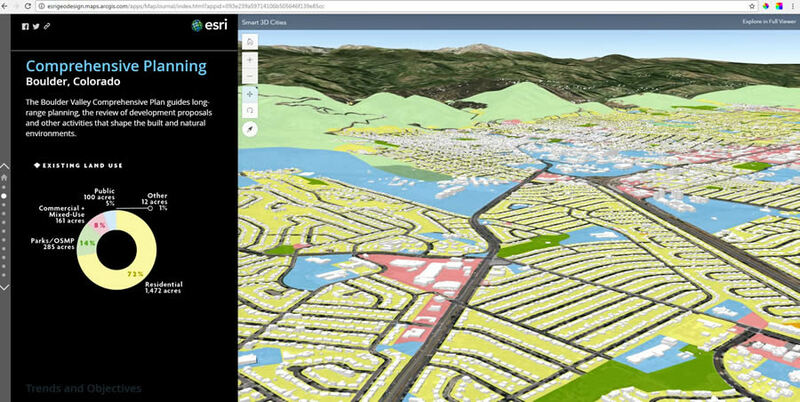 Data about land use can be analyzed and visualized in 3D maps. Where and how should the community grow? Where should the city build sidewalks and trails to lower the risk of accidents and encourage walking? What areas should be preserved as green infrastructure? How far do residents have to walk or drive to reach a public park? These are the types of questions that urban planners from around the world ask daily. And the answers are out there, thanks to the increasing availability of open and proprietary data and the growing use of geodesign technologies, such as GIS software, that make sense of the data. Analyzing and visualizing data on maps—including in high-resolution 3D city models—powers smart planning processes. The data-driven smart planning approach was one of the major topics discussed during this year's Geodesign Summit, where the theme was Geodesign: Enabling a Smarter World. 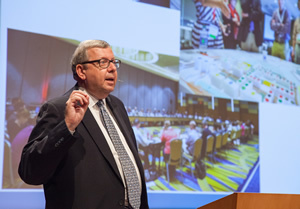 Stephen Goldsmith from the John F. Kennedy School of Government at Harvard University moderated the Geodesign Summit. "Data is everywhere and can be collected from everywhere, including from individuals walking around with cell phones," said summit moderator Stephen Goldsmith, speaking to more than 220 planning directors, urban planners, architects, engineers, GIS professionals, and academics. 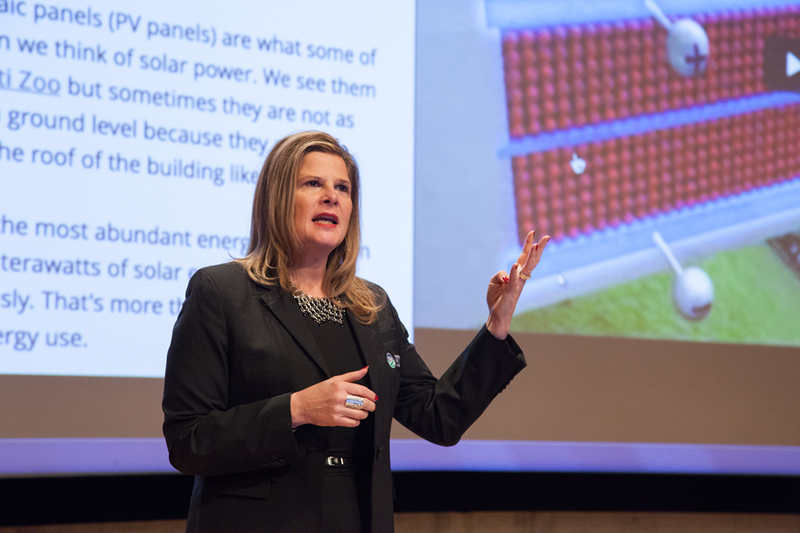 The group met for a series of workshops and presentations at the summit, held from January 24 to January 26, 2017, at Esri headquarters in Redlands, California. "[With] this massive amount of data, we need context," said Goldsmith, a professor at Harvard University's John F. Kennedy School of Government and a former mayor of Indianapolis, Indiana. "GIS is an organizing context for data." Esri president Jack Dangermond, who had recently gone to India to inaugurate the GIS Innovation Hub in Hyderabad, said the country is embracing the idea of data-driven smart cities faster than in some areas of the United States. Dangermond spoke of how digital technology is everywhere in India, "[from] tiny rural villages to growing metropolises." Every person who walks around with a mobile phone is a potential sensor or collector of real-time data that, once analyzed and visualized, can be used to make decisions and improve how a community functions. 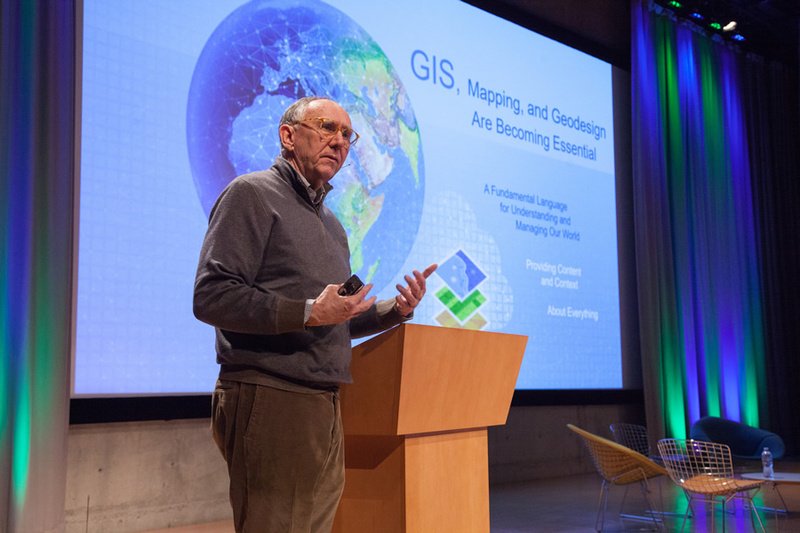 Esri president Jack Dangermond believes that GIS is critical to creating data-driven smart cities. 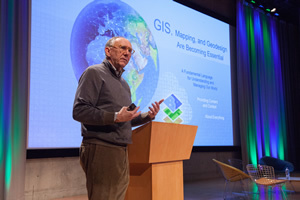 Real-time data collection using sensors and the Internet of Things (IoT), coupled with advanced spatial analytics and visualization of big data or smart GIS, will help drive problem solving, Dangermond said. And there are big problems to solve, including climate change, loss of nature, and loss of biodiversity, he said. "These are problems we are going to face for the rest of our lives, [so] we need to collaborate and work together," Dangermond said. "GIS and geodesign represent a framework and process for creating a smarter world." Creating a smarter world starts with smart planning. That's where geodesign comes in. Geodesign combines the art of design with the science of geography in the planning process. Stakeholders provide input, and geodesign practitioners then use creative design techniques, rigorous methodologies, and spatial analysis and mapping to find the most suitable sites for housing developments, parks, office space, transit, and renewable energy projects. All government organizations, from small municipalities to major cities, face vexing planning issues that often revolve around questions of where and how to grow while maintaining the unique character of the community. For answers to those questions, some cities, such as San Francisco, California, and Boulder, Colorado, are trying 3D geodesign technologies. Scott T. Edmondson, a planner-economist for the San Francisco Planning Department, says 3D GIS is a powerful visual tool to communicate data. 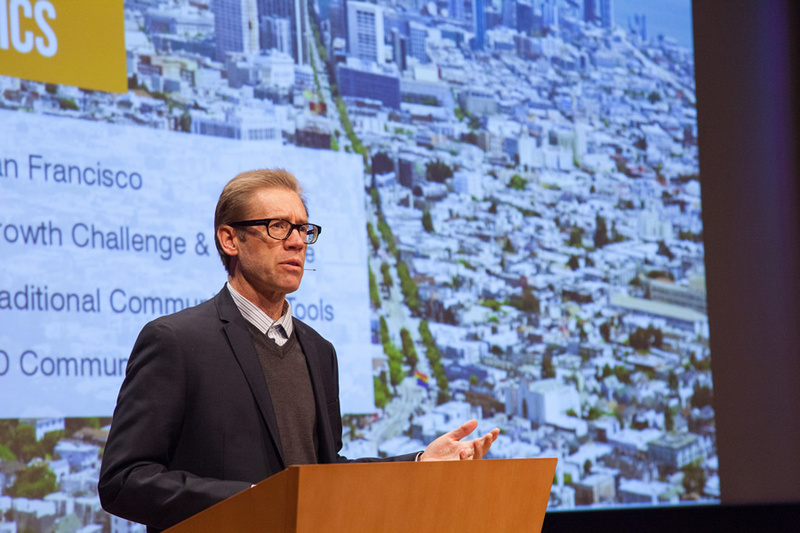 At the summit, Scott T. Edmondson, a planner-economist for the San Francisco Planning Department, said that as the city of San Francisco studies options of how to grow, it is beginning to use 3D GIS technology. 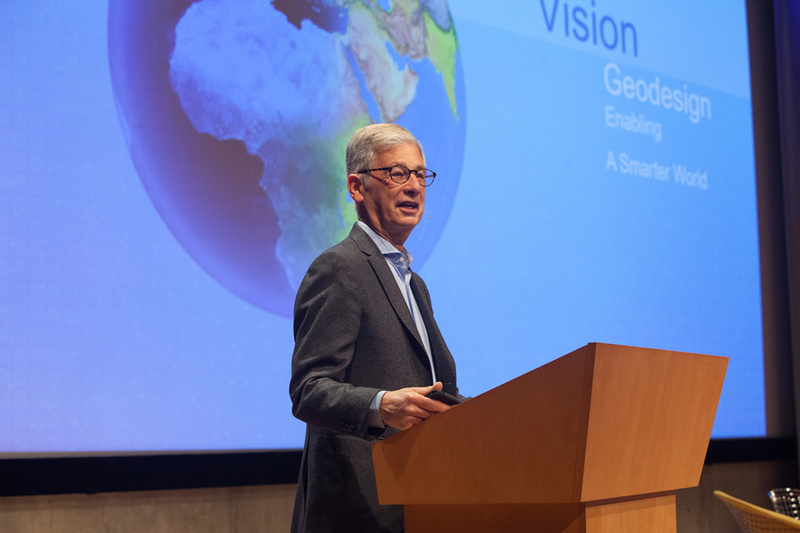 He showed the summit audience how city planning staff and an Esri team used 3D GIS tools to analyze and visualize data pertaining to height control of buildings, housing and jobs capacity, housing and growth, and transit access to housing and jobs. Edmondson said that the city has typically used tools such as 2D maps, Microsoft Excel tables, and charts to communicate planning scenarios. However, the 3D tools and techniques used for the demonstration project provided a "better visual explanation" of the data, he said. "People get it quickly," Edmondson added. In Colorado, work is currently under way on updating the Boulder Valley Comprehensive Plan, a long-range planning guide for Boulder, a community with a population of 107,000 people and 100,000 jobs. That means there's a large commuter workforce, and a need for more affordable housing—an issue that the city's planners are studying and creating a strategy for to address. The city's comprehensive planning manager, Lesli Kunkle Ellis, told the audience that the city is expected to continue to rapidly grow during the next four or five years. To study and communicate data and issues related to land use, the City of Boulder has used Esri technology including Esri CityEngine 3D modeling software and Esri Story Maps, such as the Esri Story Map Series app Boulder Valley Comprehensive Plan Story Maps. The story maps show, for example, how much land in the City of Boulder is currently residential (38 percent), commercial and mixed use (8 percent), parks and open space/mountain parks (29 percent), publicly owned (14 percent), and land that is uncategorized (1 percent). 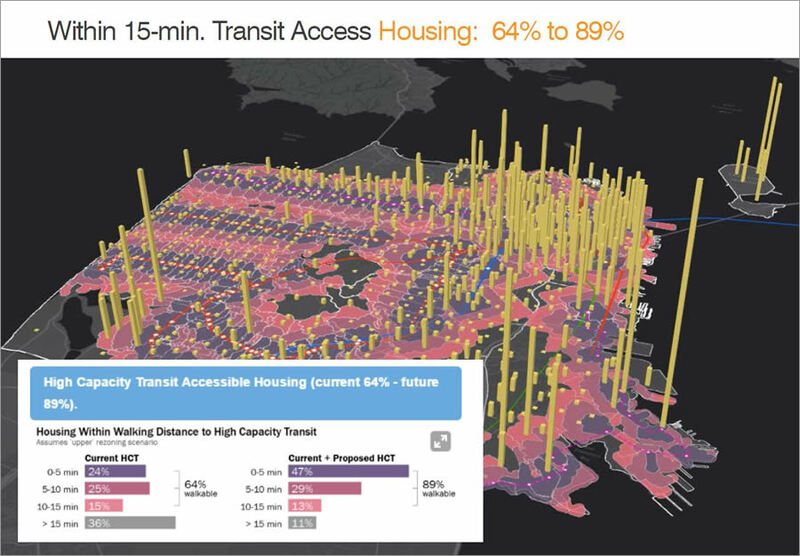 This map shows the percentage of housing in the City of San Francisco that's within a 15-minute walking distance to high capacity transit. The Boulder Valley Comprehensive Plan Story Maps app includes 3D maps of subcommunities with layers that, when turned on, show wetland areas, bike lanes and pedestrian trails, sidewalks, transit routes, parks and open space, zoning districts, and capital improvement projects. Ellis said that Boulder residents are very interested and engaged in the planning process. To give the public the opportunity to explore the land-use data, the city put the story maps on its website. "The story maps are a fantastic tool," said Ellis. "We would like to [create] more." Kenton County, Kentucky, also uses GIS maps to study issues and communicate with the public. Trisha Brush, GIS director, and Emi Randall, director of planning for Planning and Development Services (PDS) in Kenton County, told summit attendees about the county's LINK-GIS, an information portal that lets people explore a wide selection of online maps. Brush and Randall also talked about Northern Kentucky mapLAB (NKYmapLAB), the product of a PDS initiative in which data is analyzed to produce story maps intended to inform and solicit feedback from the public and elected officials. Various issues are addressed, including some that are connected to Direction 2030, the county's long-range plan. Trisha Brush, a GIS director from Kenton County, Kentucky, talked about the importance of GIS in planning at the Geodesign Summit. Esri Story Maps apps have been created on topics such as walkability and sidewalk connectivity, traffic congestion, the urban tree canopy, solar power potential, and a plan to widen a state highway in northern Kentucky. "If a picture is worth a thousand words, a map is worth a million," Brush said. Brush and Randall gave a presentation that included the PLAN4Health in Kenton County story map. It shows the results of an analysis done to identify food deserts, which are areas of a community that lack easy access to healthy foods such as fruits and vegetables. The American Planning Association (APA) funded a Kenton County PLAN4Health Coalition project to conduct the analysis and support a program that's bringing more healthy foods into corner grocery stores and educating people about nutritious foods. Brush and Randall said that one program participant was Kimmy's Korner, a neighborhood grocery store in Covington, Kentucky. The store owner added apples, oranges, yogurt, fresh vegetables, and sweet potatoes to his shelves. To support Kimmy's Korner, money was provided for refrigeration equipment such as a freezer and a deli case. The green circular areas on this map represent a half-mile radius service area for stores selected to participate in the Healthy Corner Store initiative. These stores were selected based on a number of factors including history of community involvement, no code violations, and being current on taxes along with the ability to fill the gaps in access to fresh and healthy foods. "The owner, Mark, wanted to help kids eat healthier," Randall said. The Kenton County PLAN4Health project and story map serve as a good example of what James M. Drinan, APA's executive director, spoke of in his Geodesign Summit talk, "Placemaking as Storytelling." Urban planners need expertise in both design technology—including geodesign—and storytelling, Drinan said. Planners need to educate themselves about the latest technology in order to gather and communicate stories about a place, which is important in the design process, he said. "Technology is not just a tool but a compelling requirement that planners must master. . . . Otherwise, we risk irrelevancy," he said. "We risk being left behind." While data is important in planning, so are stories, according to Drinan. Planners need to gather people's perspectives about issues in order to create plans for the community's well-being, he said. 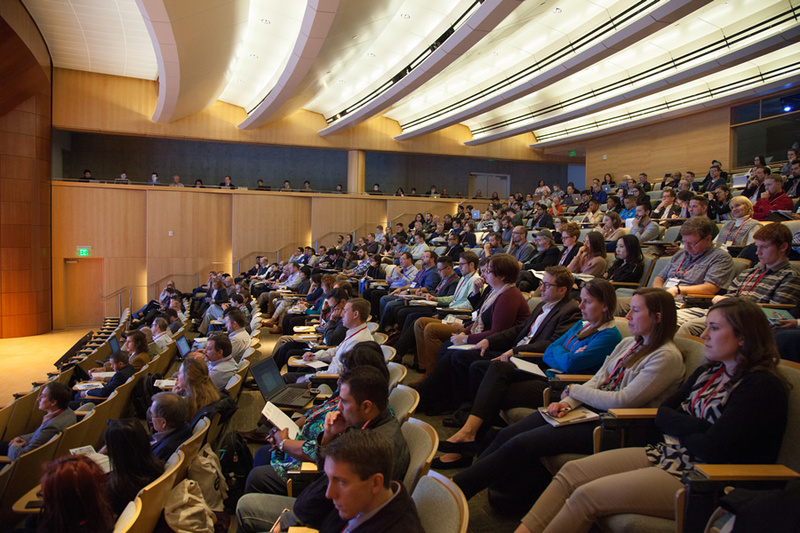 More than 220 people gathered at the Esri auditorium to listen to geodesign presentations. "As planners, we need to listen to the stories that people tell [us]," Drinan said. "I want to start by understanding everyone's perspective. I need to ask questions and get information from them." Stories carry impact and can be used to explain a plan better than data alone can, according to Drinan. For example, a story can illustrate how straightening a road and adding lighting to an area will protect children who are riding their bikes to the store, he said. "Storytelling humanizes the data," said Drinan. That's why using technology such as Esri Story Maps is so helpful, said Drinan, pointing to the PLAN4Health in Kenton County story map as an example. Interactive maps of the neighborhoods where grocery stores are within easy walking distance or near mass transit service. James M. Drinan from the American Planning Association stressed the importance of tying storytelling and geodesign together. Profiles of some of the stores that participate in the Covington Healthy Corner Store Program. Educational information on the types of foods to eat to stay healthy. "We don't just need to tell stories—we also need to link placemaking to the public good," Drinan said. "And in order to improve people's lives in this digital age, planners need to embrace new technologies. If we don't take advantage of new technology, we risk losing our audience." To learn more about geodesign, read the Esri e-book Geodesign in Practice: Designing a Better World. To find out more about the use of use of 3D GIS in land planning including in Boulder and Hollywood, California, view the Esri Story Map, Smart Communities: Better Planning.